We specialize in custom programming using tools such as PHP/MySQL. From project design to architecture and implementation, we can provide a solution which is easy to use, scalable and effective. ELP is an initiative by the Illinois Green Economy Network in partnership with DCEO and MEAA to make energy testing equipment available for borrow. 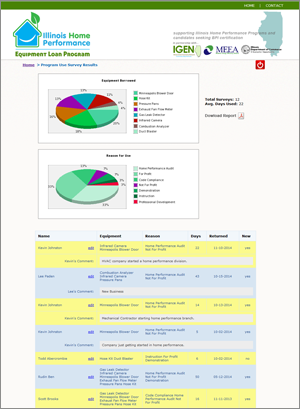 The site features an online equipment tracking system that enables borrowers to apply to for equipment loans and college program administrators to manage users and equipment assigned to them. The implementation provides many useful features including system alerts and state wide tracking and statistics.